Learn 3 easy chords and a scale! 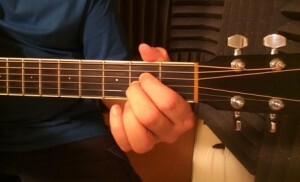 The first guitar chords you should learn are E minor, A sus2, and Dsus2, as these chords use only two fingers. 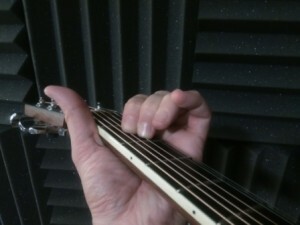 It’s obviously easier to get two fingers onto the right string/fret than it is to try to put down three, so we’re going to wait on some of those other chords like E major and A major. There are pictures below showing the me holding these chords and there are two kinds of photos: one that is a sort of a front view, and another taken from your perspective. If you have problems with the Dsus2 chord, then just spend the first few days doing the whole note exercise and then try the half note and quarter note section of the exercises. 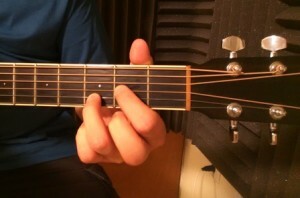 In addition to doing the chord exercises in the first week, it’s important to also do the first scale exercise as well. 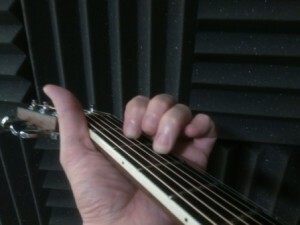 Remember to press down the strings with your fingertips, and that it’s okay to have your thumb over the top of the neck, as long as your fingers are long enough to reach around the neck and not lean against the adjacent strings. If that is the case, you will need to put your thumb behind the neck. These chords will show up in songs, particularly E minor. Asus2 and Dsus2 will appear as well, but you’ll usually use them with a similar chord. For example, there are a lot of songs that will have an A major to Asus2 chord change, or D major to Dsus2 chord change, but I have not included exercises for those chord changes for two reasons. First, A major requires the use of three fingers, and I don’t want you to have to try that at this point. 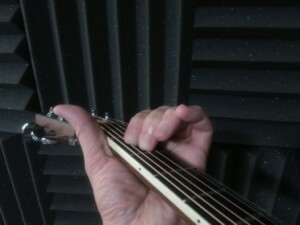 Second, once you’ve learned how to do A major and D major, switching from them to Asus2 or Dsus2 only requires lifting one of your fingers away from the strings, which is a simple enough motion that you don’t need a special exercise to master it. If you like the format of this lesson and want to support the website, you can purchase a copy of my book for beginning guitar players by clicking here. It’s full of chord exercises for beginning guitar players, and has strumming patterns and scales to further develop your abilities.